We’ve not had a lot of updates to the blog lately. There are a few reasons for that. One, we are covering the wing. There is only so much to say about that. I was told that after we’d covered one wing, we’d have the hang of it. I was doubtful but I have to say after covering one wing, I think I may have the hang of it. We made a few little mistakes here and there, but overall the wing came out better than I would have expected. More importantly, I’m at the point where I feel like I can make a mistake and fix it. Not as in strip off all the fabric and start over from scratch fix it, but just fix the wrinkle, bubble, etc, and move on like it was never there. What is that saying? A professional knows how to hide his mistakes? Something like that. 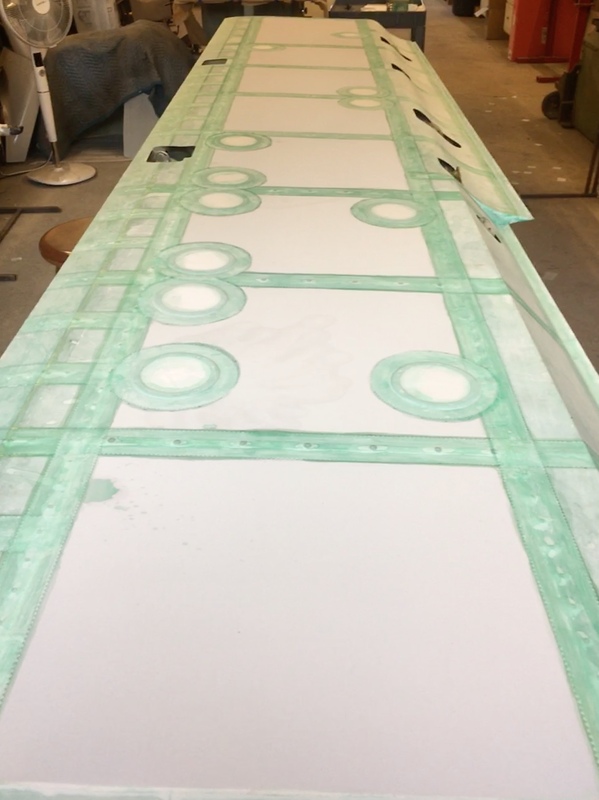 We had a brief interlude in the airplane build this month. The Spohns and our family both took a vacation along with Grandma, who was the ring leader, to Grenada and St. Vincent and the Grenadines. It was an epic week and a chance for me to sail the Southern windward islands, which I’ve never done. We had a great crew and everyone had a large time. After being gone for a week, it was tough to get back in the groove. Between all the to dos waiting when you get home and being out of the habit of working on the boat (and working period) it took most of the next week to finally get back in the shop. While I was gone, the avionics from GRT Avionics showed up. Dustin grabbed them for me and put them in the shop. I eagerly opened the box of goodies to see what had shown up. Sadly, I was a bit disappointed. The EFIS looks perfect. But the engine monitor was for a Lycoming, not a Rotax, which is what I ordered. Also the autopilot servos showed up, but no mounting kits or hardware. Apparently I was supposed to know I had to order them separately. The last straw was when I went to install the magnetometer. This needs to be installed in the wing so we can cover the left wing next week. I noticed a rattle coming from inside. I opened to case to find that two of the elements of the circuit board were never attached to the board. They are wired, but not physically attached and secured making the magnetometer useless as it will break probably by the second flight. I emailed and called GRT, with no response and no way to get a person on the phone. Eventually I did receive a call back from a very nice guy who informed me that my magnetometer would need to come back to them and that they shut the company down for the week, for Oshkosh. So next week, sometime, I should be able to get it handled. Argh!! I have a wing I need to cover and I’m losing two weeks, plus shipping, for one stupid magnetometer. Who shuts down an entire company and doesn’t put a notice on the website or on the answering machine? I was very excited to use GRT. So far, I’m less than impressed. Before I knew the magnetometer was bad, I made up an install plate for it out of .020 aluminum. I needed to span the lightening holes in the rib. I also planned on putting the magnetometer inboard on the wing rather than on the wingtip as recommended. 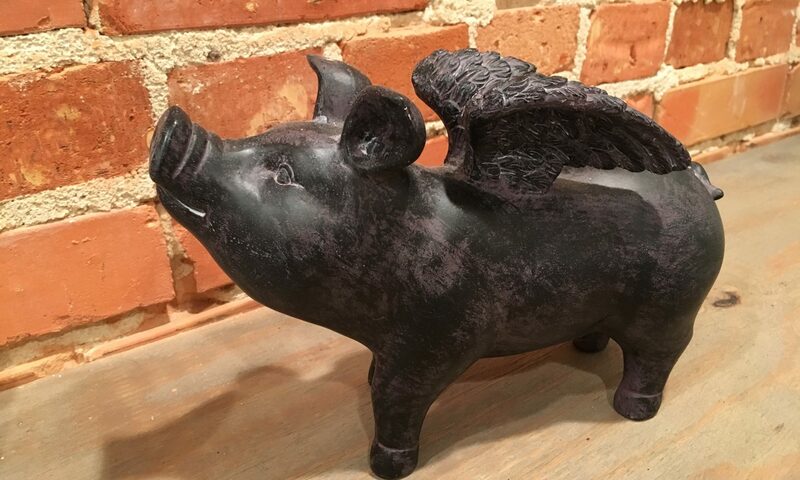 The strobes are going to be installed out on the wingtip and I was worried about the pulses of electricity messing with the very sensitive magnetometer. 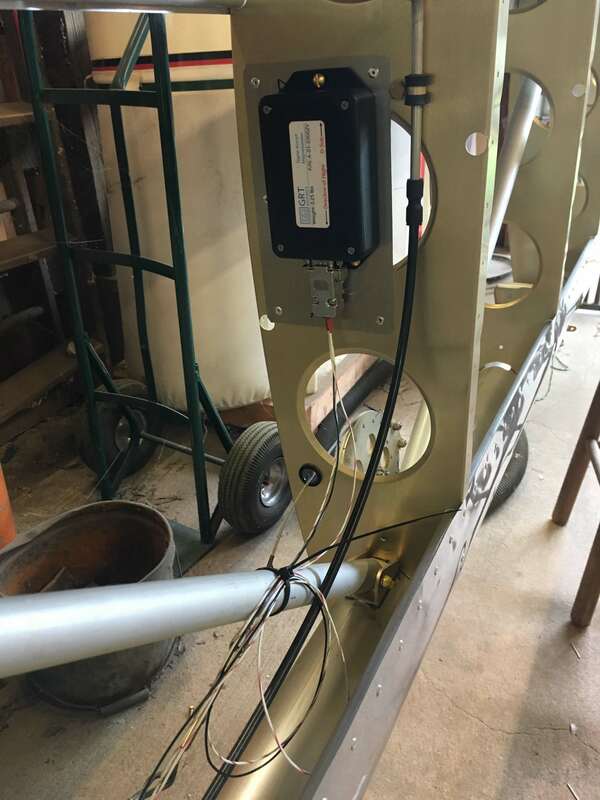 By installing it in this location, I was able to run the wires back to the fuselage tied to the pitot tube which was already carefully run through grommets with some extra room. Magnetometer temporarily installed in wing, with service loop. By this point I knew the unit was bad, but I got it installed anyway as I was stuck on anything else to do. While I was sorting out electronics and warranty returns, Spork was steadily working on the wing. During out work, we noticed a small blemish in the fabric on the top of the wing. We’ve been very careful around the wing so I can only assume this was a factory defect that appeared when we tightened the fabric. Regardless, it needed a patch as the entire wing was covered at this point. I researched in the SuperFlite manual, and online, and couldn’t find any decent information on making a patch. 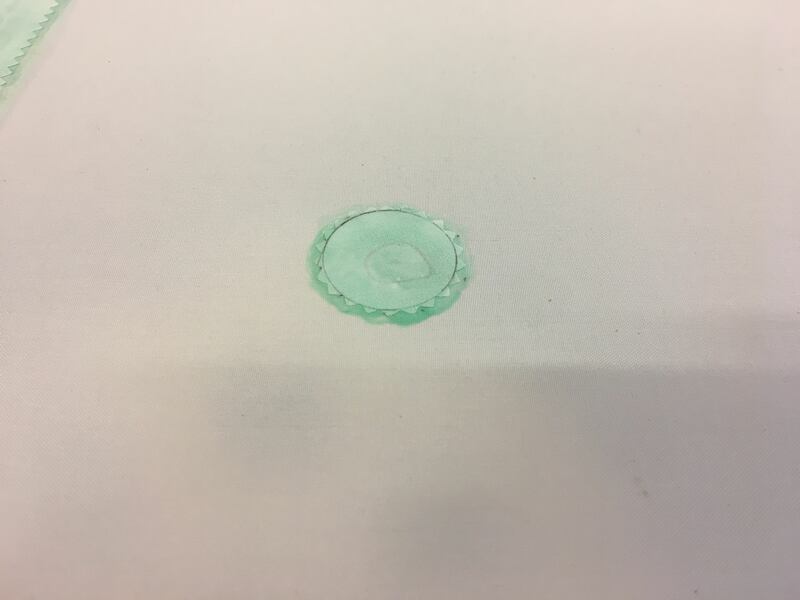 I knew it was basically a doily like we would use on the inspection rings, but what I couldn’t find was if I should shrink the fabric after installing it. The purpose of the patch is to cover a hole. But the base fabric is already shrunk. So do I attach this patch, then shrink it too? Would that cause a pucker in the base fabric? If I don’t shrink it, then the patch isn’t really taking any load. Finally I reached out to Scott who assured me, yes, shrink the patch but only to the first temp (250 degrees). Patch installed we went back to work. Spork is very meticulous when he works on the covering, which I appreciate. 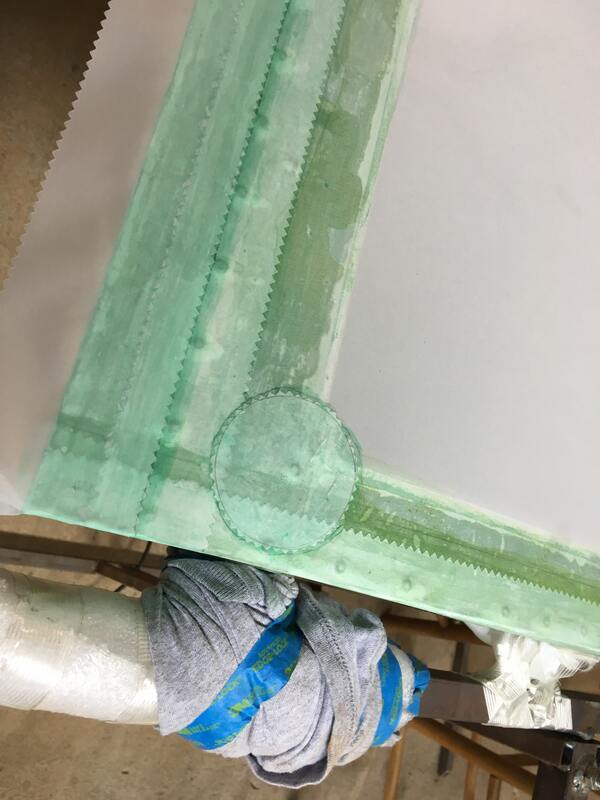 While he was working, he noted that one rivet was not covered by any of our finish tapes. Something we’d all missed up to this point. With our patching experience firmly in hand, Spork cut out a quick doily and made a one piece finishing tape for this lone rivet. This one did not need to be shrunk like the patch job required. While Spork was working on the wing, I set about working on the fuel system. I’d had Scott order some hose for fuel lines prior to ordering the firewall forward kit. I didn’t even think about the kit having its own fuel lines, but of course it did. Regardless, I’d already run the Aircraft Spruce supplied fuel line through the fuselage so I just stuck with that one. Except when it came time to install everything, I couldn’t get the fuel line to go onto the barbed fittings. It was REALLY tight. I looked at the ID of the lines, and the one I was using actually looked a bit bigger than the kit supplied fuel line so it should work. I tried again. I cursed, I went to EAA tech tips, I went to YouTube. 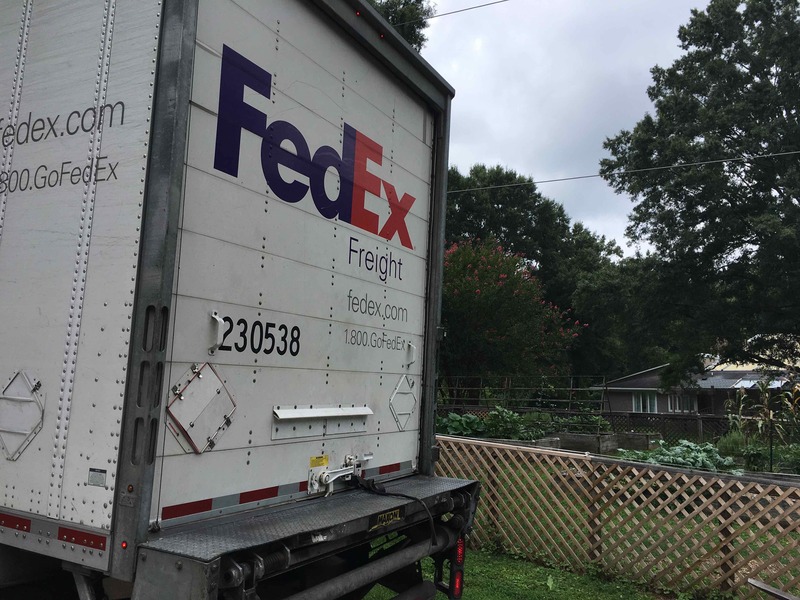 Finally I called Scott and asked him why I couldn’t get the fuel line on He couldn’t answer, but he said he’d drive up during his lunch hour and look for me. I was floored. I didn’t expect a house call from an A&P. I’m always surprised that he even answers my phone calls. But during the conversation with him, it occurred to me that maybe I should try the kit supplied fuel line, even though it appears smaller. Turns out, the fuel line that comes with the kit is a much more supple line, with less reinforcing. It slipped on like butter. I’d spent the morning nearly breaking things trying to force the wrong line onto the fittings. Once the new line was installed, it took about 10 minutes to do the entire job. Duh. 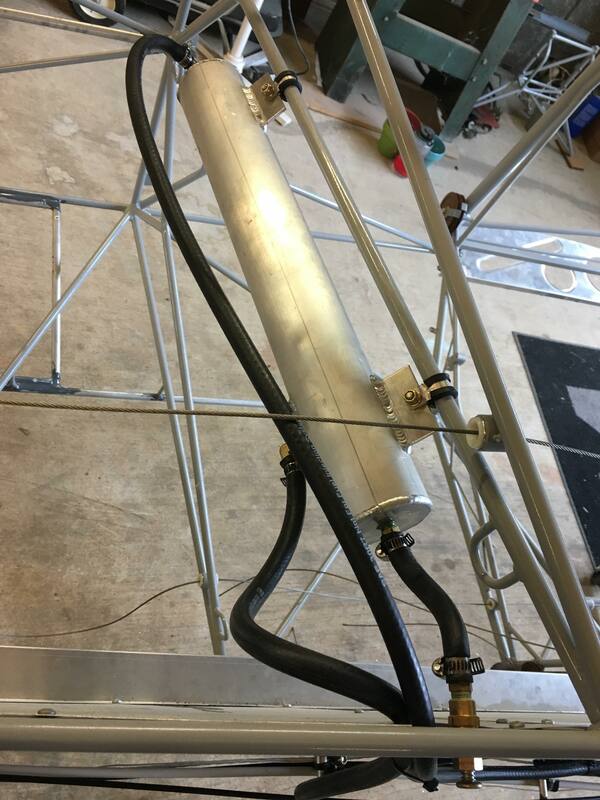 With the header tank plumbed, I went back and with a combination of Adel clamps and zip ties, secured the fuel line and the return line in place. The lines are just hanging off the front at the firewall waiting for the engine install. 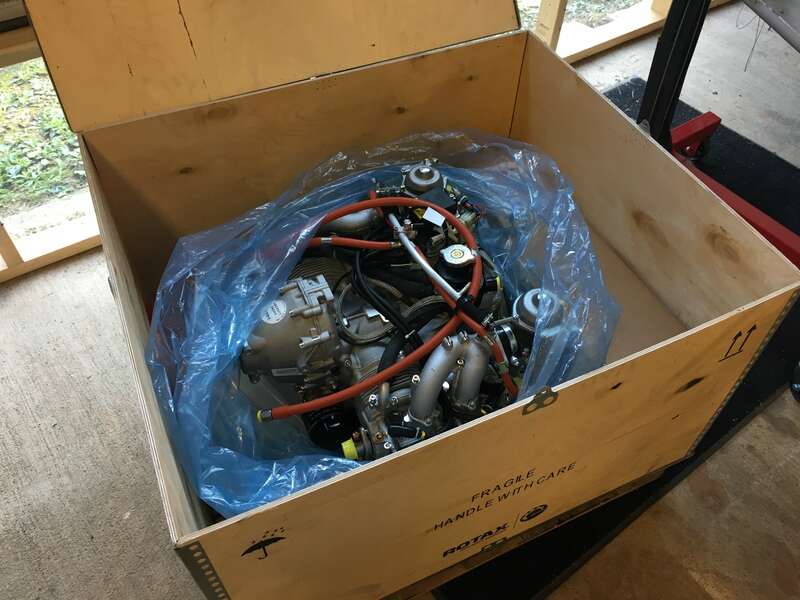 Before I left for Grenada, I ordered the Rotax 912 engine that we are going to be using. It will most likely sit in the crate for several months, but at least it will be on hand and ready to install should we make progress on the build. One of my original goals with this airplane was that it would be powered by a Rotax. I wanted to fly behind a modern aircraft engine, with proper ignition, no mixture, and the ability to operate off of automobile gasoline, or MOGAS as it is called in aviation. 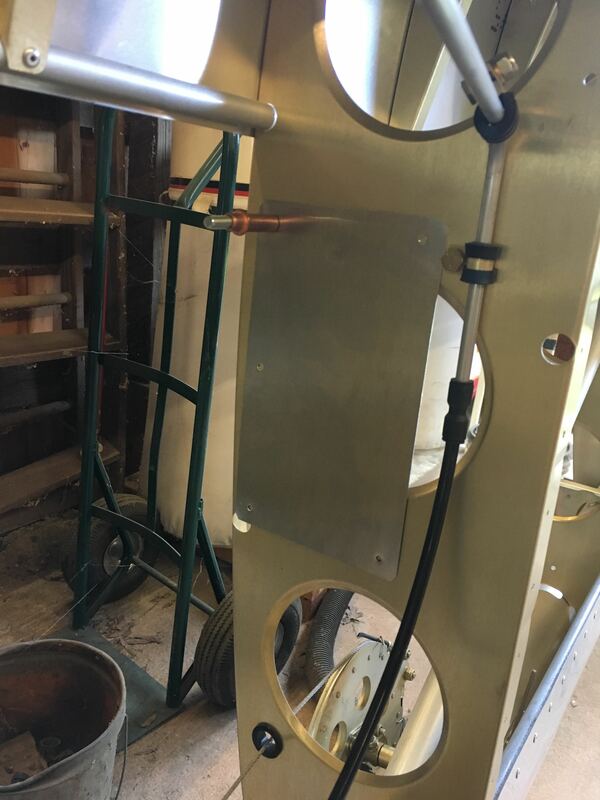 This lets me get gas from my normal source and keep it here at the farm vs having to find 100LL aviation fuel and get it here for twice the price. The last piece of the puzzle, besides the many hours of labor it will take to build this airplane, is the propeller. I have one coming from Robby as well that will surely be hanging on the wall well into this winter. But when that arrives, all the major pieces of the puzzle are on site. Now it is just up to Spork and I to assemble everything. While I was working on all the bits and bobs, Spork had been making progress on the wing. I came back over to go over the last bit of finish taping and helped him finish. Then it was time to move onto the inspection rings. As with most elements of this build, there was some trepidation over doing this for the first time. What if I put them in the wrong place? What if they don’t stick? As usual, reality turned out to be far less scary than imagination. We had the other wing sitting directly beside this one, completely uncovered. Spork and I spent some time making sure all the rings were in the correct spots, then we marked them and started cutting out doilies. Eventually Spork took off to the beach for the last summer vacation before school starts and Crystal and I worked on the inspection rings. Scuff the rings, glue the base of the fabric, glue the rings, wet the base glue, stick the ring in place, then cover with a doily. Move onto the next ring. It took about two hours to install them all. The tapes are all in place. The trim work is done, all the little bubbles and wrinkles have been addressed, and the inspection rings are installed. This wing is covered! 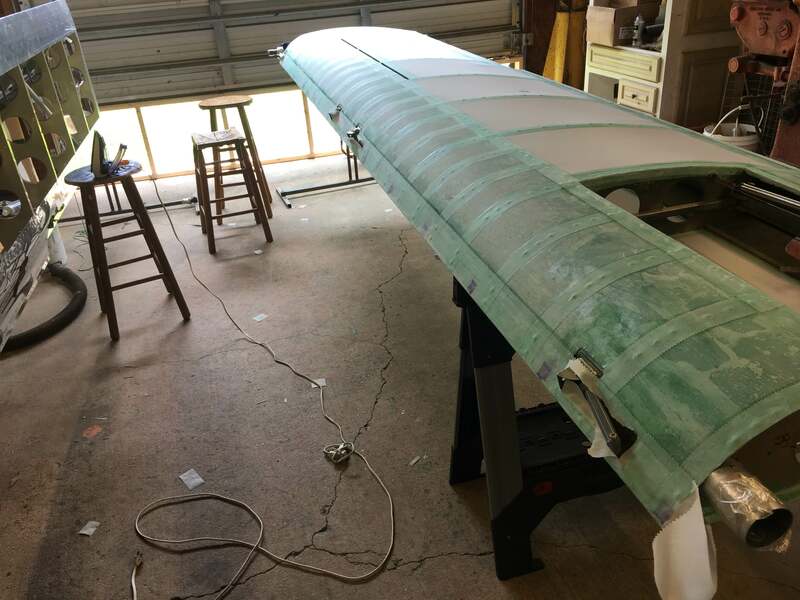 Today I’ll install the fuel tank, then move this wing over to the side and carefully cover it to protect it from light and from getting damaged. Hopefully the left wing will go much faster since we now have some experience doing this. We can’t get too far ahead of ourselves, because I have to wait till the magnetometer shows up to cover the left wing. But I can at least cover one side of it. Plus there is a ton of prep that has to be done to the wing itself. Scotch brite, cleaning, etc. Luckily Spork and Cody will be here soon so they can get to work on that portion while I go to work on the panel and the autopilot servo install. 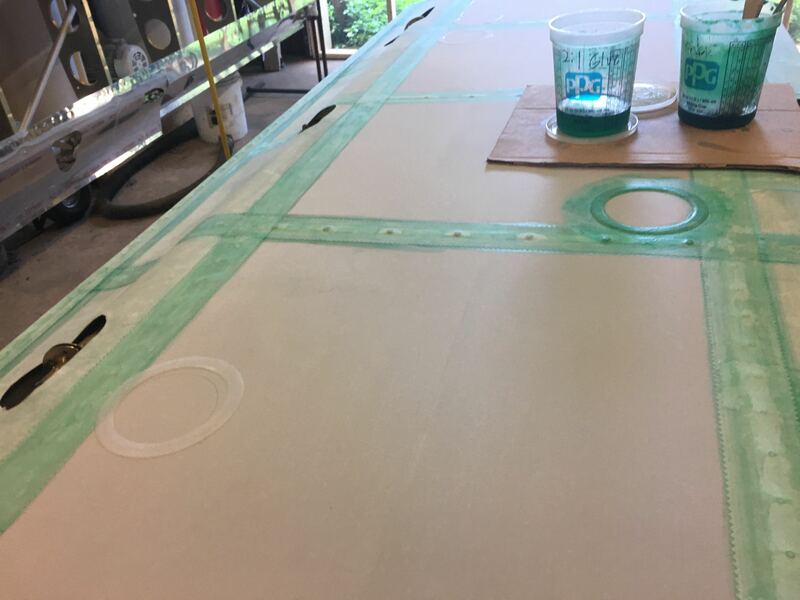 Once the left wing is covered, it will be time to build the paint booth. While that is being build, we should be covering the fuselage. Once it is covered, it will be time for paint. 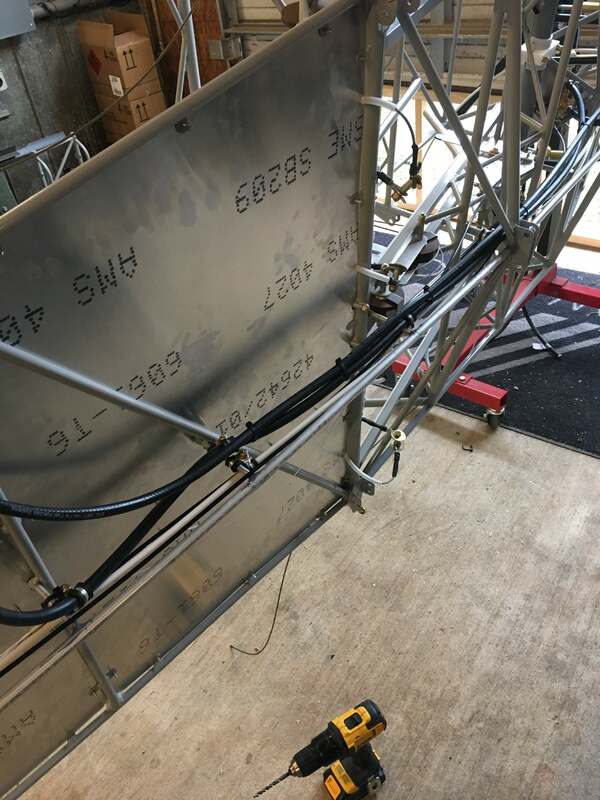 Once paint is done, we can mount the fuselage on the landing gear and finally have a rolling chassis which means sitting in the seats and making airplane noises!